We have an incinerator, otherwise known as a controlled pyrolysis oven. This is a monitored high temperature oven which turns powder coatings into ash. The heat is controlled, making distortion not an issue. This will gently remove powder coatings, ideal for wheels. Ideal for removing house old thick paints. 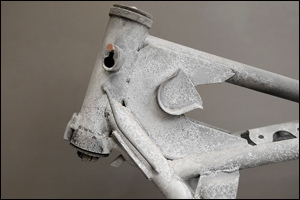 After the paint is removed, the components are grit blasted and pre-treated as new metal.